A WOMAN’S final throw of the dice to avoid entering the ‘dark world of mums who kill their babies’ saw her ex-boyfriend labelled as the ‘silent assassin’ who caused the infant’s death. 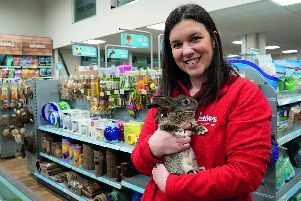 The stakes could not be higher for Roxanne Davis, 30, as the Gosport woman faces up to her day of reckoning, with the jury at Winchester Crown Court close to retiring to consider their verdict over whether she is guilty of the death of her baby Stanley. But with her former lover Samuel Davies, 24, also in the firing line over the infant’s ‘horrible’ demise, both sides have pulled no punches in blaming the other one for the injuries caused to the baby. Stanley died of a fatal skull fracture and brain haemorrhage aged just 24 days on March 28 last year. He also sustained 32 fractures to his ribs and nine fractures to his arms and legs during three separate occasions – many of which were brutal refractures. Following Davies’ defence summing up, where accusations of baby shaking were made against the woman who he admitted once being madly in love with, it was the turn of the mum’s own counsel as she sought to persuade the jury one final time of her innocence. In an impassioned plea to convince jurors, Davis’ barrister Katie Thorne QC laid the blame squarely at the feet of Davies – a man she said was ‘secretly and discreetly breaking the child’s bones’. Referring to an occasion when a bruise appeared on Stanley’s head, Ms Thorne QC continued her onslaught against Davies. ‘Stanley was crying early in the morning (after Sam had been looking after him),’ she said. ‘Doesn’t that tell you the bruise happened while Roxanne was asleep or had been out having a cigarette? ‘If Roxanne had been responsible then she wouldn’t be texting (her family) about the bruise. This is a complete indication of her innocence. Ms Thorne QC told jurors that Davis had to put up with threats from her boyfriend that he would report her to social services as their relationship descended into destruction – resulting in Davis ending it. ‘This had a profound reaction on Sam and you may think leads to him inflicting the major blow to Stanley,’ the barrister said. Ms Thorne QC also scoffed at suggestions made by Davies’ defence team that the injuries could have been the result of an accident. ‘It’s rubbish – this is the desperate work of a defendant with his back to the wall,’ she said. Attempts to downplay the significance of Davis’ cocaine use was also made to jurors. ‘It’s not like crazy party stuff that makes you stagger around. It would have made her euphoric and stay up late,’ Ms Thorne QC said. ‘I urge you to keep your feet on the ground and not get hysterical over this. You may know people who take cocaine and you may feel these drugs are a normal part of modern life. Ms Thorne QC also slammed prosecutor James Newton-Price QC for being ‘snooty’ and urged jurors not to be seduced by his ‘charming’ summing up after claiming he had ‘mis-remembered evidence’ in the case. Davis, of Lee Road, Gosport, and Davies, of Mayfield Road, Southampton, who was not the biological dad of Stanley, are on trial accused of causing or allowing the death of the infant.